My kids have been sick all week, so ending this week is actually invigorating. Everyones now doing alot better and we're hoping this is the last of those winter sick days. So off we go to our good friends for the weekend for a bit of relaxation. There is actually nothing like spending time with old friends to unwind. Now lets talk about this outfit. Am I the only person in the world who wears button down cardigans actually buttoned? I think I am. Regardless, I love how it looks on me and that is all that counts. For this look I paired it with some classic black bits- a black denim skirt and black opaque tights. 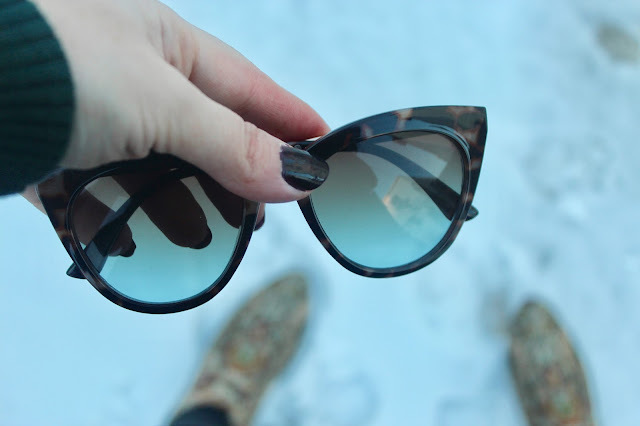 The paisley printed gold boots and cat eye sunglasses completed the look! On My Lips- Stila Stay All Day Liquid Lipstick in "Chianti"
On My Nails: OPI "Lincoln Park After Dark"